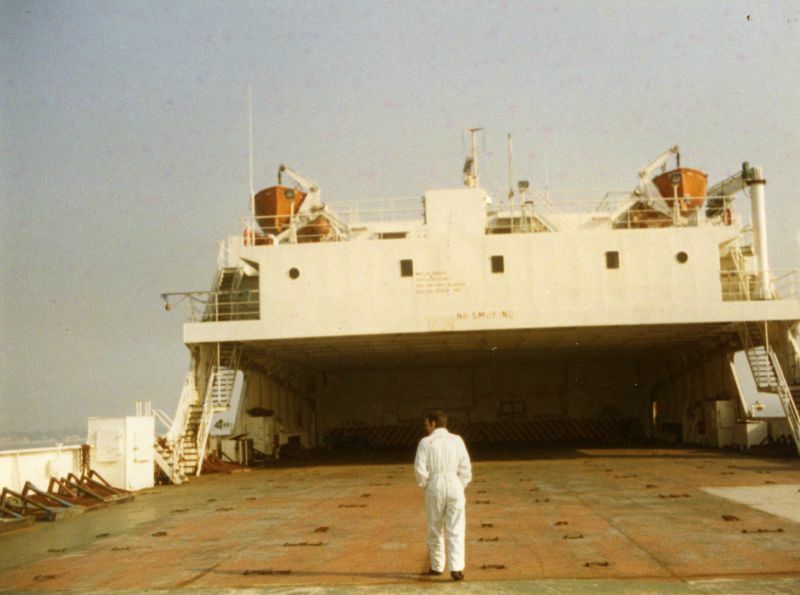 SEAFREIGHT FREEWAY was laid up during the autumn months of 1984 and in January 1985 she had a team of engineers helicoptered aboard to get her wound up for another contract. She had been in service between Hull and one of the Scandinavian ports as lorry/container transport. During the Xmas period there was a storm, on Boxing day she dragged her anchors during a Force 9, all I had was a hand held VHF so I called the coastguard. Due to the height of the waves, darkness and poor visibility I was unable to tell exactly what was happening, but I knew instinctively that we had changed position so I checked my waypoint markers on the two shores. The Harwich coastguard did not believe me but eventually I persuaded them to check the ships position from the shore. When the storn died down and the Tugs were on their way, the ship settled in her new position - as the tide turned and the ship swung round we found ourselves within about 6 metres of the next ship downstream, we were seriously in danger of collision. The watchman on the next ship threw me some provisions just to prove how close we had come. During the storm I had been unable to get help or to peruade anyone we had actually changed position, even the watchmen on adjacent ships had been doubtful, the height of the action had been 24 hours before she settled down on sunday, when I could see we were a few meters from the adjacent ship and realised the implications of what could have happened. They eventually made a decision to call out the two large tugs that tow the cruise ships and they were putting her back in place as I was being collected by the pilot boat. I think this episode helped the owners of SEAFREIGHT FREEWAY to decide to move her immediately so she was recommissioned and I sidestepped to the role of looking after the engineers on board. SEAFREIGHT SEAWAY had luxurious accommodation for the top ranks on board plus about 150 - 200 berths in shared cabins for the lorry drivers. She was fully stocked when she was laid up and there was provisions onboard for months on end. She had very flat high sides which caught the wind so she always listed by about 5 degrees. I was on this ship on my own when the storm broke, but had shared the responsibility with another watchman up until the Xmas break. Built as LUCKY RIDER. 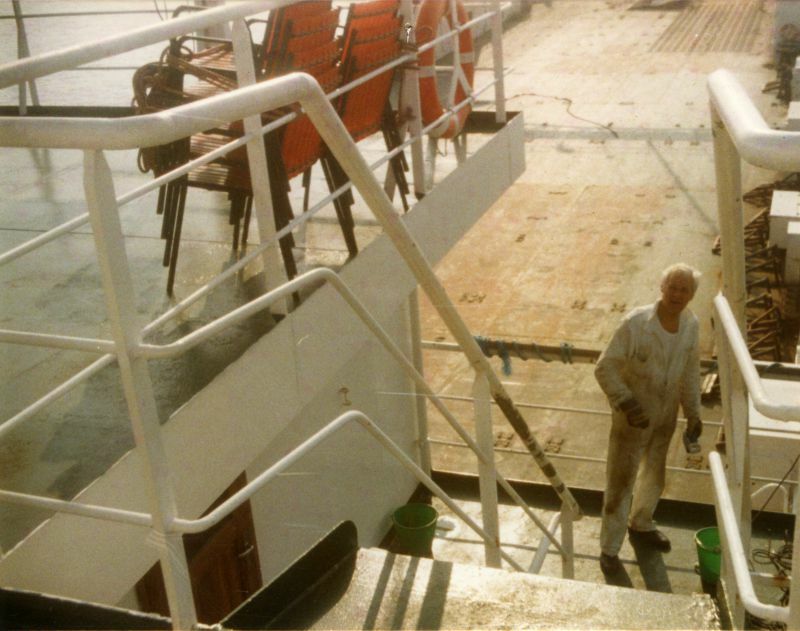 Renamed STENA DRIVER-1984, SEAFREIGHT FREEWAY-1985, SERDICA-1988, NORDIC HUNTER-1990, ARKA MARINE-1991, ASK-1991. Believed to have made a second visit to the Blackwater in January 1986.